View of a modern Bleach Mill in 18th century Ireland. This is the ninth plate in a series of twelve views of the linen manufacturing process, produced by W. Hinks. 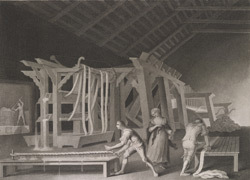 In the 1730s bleachers adopted new techniques of bleaching linen; they adapted the machinery of the local woollen mills and used them to bleach the material. This machinery greatly increased production rates and instead of taking five months to produce white linen it took just one day. To the left of this print a worker can be seen rinsing linen in cold water, this was the final process to take place in the mill.